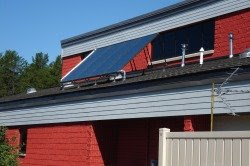 . . .each of Madison’s 11 firehouses is equipped with a solar hot water system, serving anywhere from 45 percent to 60 percent of the buildings’ collective hot water loads and offsetting 205 tons of carbon dioxide (CO2) emissions each year.